Can be used continuously for 5000 hours. Available with loud buzzer, alarm lamp from 4 dimensions, peak hold function. 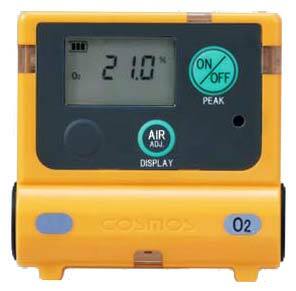 Available with TWA (Time Weighted Average) gas concentretion display, memory of peak value, and peak hold function. Available with gas calibration kit (Optional). Battery life may vary with ambient conditions, conditions of use, storage period, battery manufactures, etc.